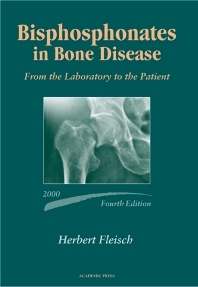 This book is an essential handbook on bisphosphonates, the most widely used new class of drugs for osteoporosis therapy. It reviews basic physiology in addition to the indications and adverse reactions of these drugs. Bisphosphonates in Bone Disease, Fourth Edition, discusses the compounds' chemistry, mechanisms of action, and animal toxicology before presenting a clinical picture of the diseases treated by bisphosphonates. The book provides a table listing the trade names of the commercially available bisphosphonates, registered indications, and the available forms for various countries. The revised Fourth Edition contains approximately 50% new material, including information on all of the latest drugs. Bone and Mineral Metabolism: Bone Physiology: Morphology. Composition of bone. Modeling and remodeling. Calcium homeostasis. Bone as an organ. Assessment of bone turnover. Bisphosphonates-Preclinical: Background to the pharmacological development: Chemistry. Actions. Physicochemical effects. Biological effects. Inhibition of bone resorption. Inhibition of mineralization. Pharmocokinetics: Intestinal absorption. Distribution. Renal clearance. Other modes of application. Animal toxicology: Acute toxicology. Nonacute toxicology. Paget's Disease: Definition. Epidemiology. Pathophysiology. Clinical manifestations. Treatment with drugs other than bisphosphonates. Treatment with bisphosphonates. Osteolytic tumor-induced bone disease: Definition. Pathophysiology. Clinical manifestations. Treatment with drugs other than bisphosphonates. Treatment with bisphosphonates. Non-tumor induced hypercalcemia: Definition. Pathophysiology. Clinical manifestations. Treatment with drugs other than bisphosphonates. Treatment with bisphosphonates. Osteoporosis: Definition. Epidemiology. Pathophysiology. Clinical manifestations. Treatment with drugs other than bisphosphonates. Treatment with bisphosphonates. Heterotopic calcification and ossification: Definition. Pathophysiology. Clinical manifestations. Treatment with drugs other than bisphosphonates. Treatment with bisphosphonates. Other diseases: Adverse events: Bisphosphonates in general. Individual bisphosphonates. Contraindications. Future prospects.